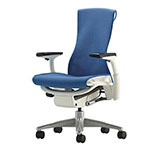 Eames Aluminum Group Soft Pad Office Task Desk Chairs by Herman Miller - Ergonomic Seating Aeron Chair by Herman Miller. 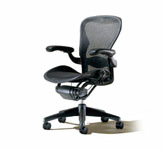 BLACK COLOR CHAIRS IN STOCK FOR IMMEDIATE SHIPPING. 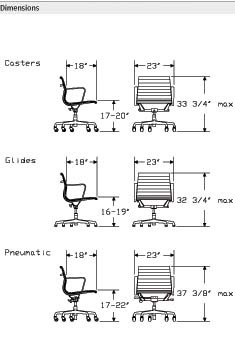 Eames Aluminum Group Soft Pad Management, Executive, Lounge and Side Chairs - You know it at first glance - it's an Eames design. Timeless, sophisticated, refined. The lithe Aluminum Group chair bears the distinctive stamp of Charles and Ray Eames, the most famous design couple in the world. 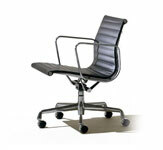 This graceful silhouette sits equally well in retro interiors, elegant lobbies, or hip young offices. Add executive, management, side, and lounge models, and there's everything you need for a statement of enduring design excellence. Made in the USA. Available Colors and Fabrics. 2Z - Slideshow - 100% polyester. Herman Miller fabrics. 3P - Colorguard Vinyl - 100% vinyl. Herman Miller fabrics. 3S - Echelon - 100% polyester. 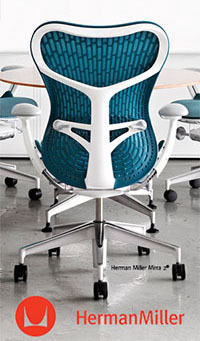 Herman Miller fabrics. 3A - Moire - 100% recycled polyester. Herman Miller fabrics. 8V - Railroad - 100% recycled polyester. 8R - Twist - 100% recycled polyester. 3B - Square Peg - 100% recycled polyester. 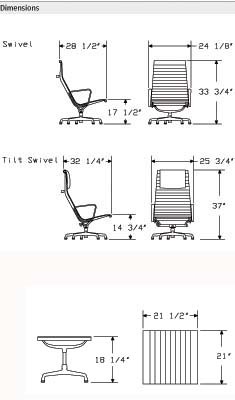 Herman Miller fabrics. 92 - Crepe - 100% recycled polyester. Herman Miller fabrics. 5K - Wickendon - 100% polyester. Herman Miller fabrics. 5G - Checkmate - 100% polyester. 8S - Coil - 100% recycled polyester. 54 - Cygnus Mesh - 69% elastomeric, 31% polyester. 8Y - Spools - 51% recycled polyester, 49% polyester. 7Y - Bingo - 100% pvc-free polyurethane. Antimicrobial. TI - Messenger - 78% post-industrial recycled polysester, 15% polyester, 7% nylon. Maharam fabrics. T4 - Stars - 100% recycled polyester. Luna textiles. V2 - Waterfront - 100% recycled polyester. Maharam fabrics. T3 - Fluffy - 73% wool, 17% acrylic, 8% polyester, 2% nylon. Luna textiles. TU - Fresco - 39% rayon, 36% polyester, 25% cotton. Luna textiles. 21 - Leather (Category 9) 100% leather from Austria. Chrome free. VZ - Leather - Open Line (Category 9) 100% Leather from Austria. VB - Edelman All Grain Leather is 100% European leather. Full-grain aniline-dyed. Perfect for high traffic areas. VC - Edelman Dream Cow Leather is 100% European leather. Full-grain aniline-dyed. Gentle calfskin grain. Great versatility, perfect when Royal Hide is out of budget. VE - Edelman Metallic Dream Cow Leather is 100% European leather. Full-grain aniline-dyed. A gentle calfskin grain, infused with metals and soft shine. On cowhide for huge versatility. VR - Royal Hide leather is 100% European leather. Full grain aniline-dyed. This versatile leather is the most beautiful of its kind. Will develop a rich patina over time. It's uncanny. A chair designed in 1958 as outdoor seating still manages to look both classic and contemporary in 21st century interiors. The chairs' clean, trim lines make them appropriate for all kinds of places, from classic and contemporary homes to elegant offices to hip startups. Aluminum Group, also upholstered in traditional fabric or leather, is ribbed at 1 7/8-inch intervals for a clean, refined appearance. The Cygnus mesh option has a lighter-scaled, translucent quality. Never ones to favor style over substance, Charles and Ray Eames gave this chair an innovative suspension that creates a firm, flexible "sitting pocket" that conforms subtly to the body's shape. They created that suspension by stretching a continuous piece of seat-back upholstery tautly between lightweight aluminum side ribs. 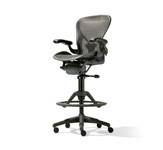 Executive and management models come with seat-height and tilt-swivel adjustments; pneumatic lift and tilt lock are available as options. 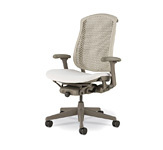 With one-piece, curved aluminum side ribs and a five-star, die-cast aluminum base, the chair is strong, yet lightweight and easy to move. 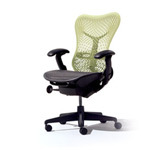 Aluminum Group chairs are made of 67% recycled materials and are 90% recyclable at the end of their useful life. You know it at first glance - it's an Eames design. Timeless, sophisticated, refined. The lithe Aluminum Group chair bears the distinctive stamp of Charles and Ray Eames, the most famous design couple in the world. 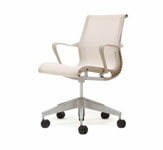 This graceful silhouette sits equally well in retro interiors, elegant lobbies, or hip young offices. Add executive, management, side, and lounge models, and there's everything you need for a statement of enduring design excellence.